Out of all the diets championed by health experts these days, veganism can seem like the most intimidating. The name almost sounds like a religion. And perhaps that’s fitting: Many vegans cite ethical reasons for why they only eat plant-based foods. Values aside, the lifestyle can be a pretty big commitment: Vegans skip any animal-derived product, including meat, dairy and eggs. This extends to foods processed with animal products, like refined sugar. Add up all of the dietary restrictions, and you have a nutritional plan that only the most committed people can sustain. It’s precisely these reasons that scare some people off of veganism altogether. The good news? You don’t have to become a full-fledged vegan to reap many of the benefits of the diet. In fact, a growing number of health experts believe that simply eliminating meat and dairy for a few days a week can make you healthier. One reason: Cutting out animal-products makes more room in your diet for fruits and vegetables—a goal that most people fail to meet. According to the CDC, nearly three out of four people eat fruits and vegetables less than five times per day –which is a shame, since a study in the European Heart Journal found that with each serving of produce a person consumes, their risk for ischemic heart disease declines by 4%. Those who had eight daily servings of fruits and vegetables lowered their risk for the disease by a whopping 22%. Skipping animal products can also help you reduce your saturated fat and cholesterol intake, says Nicole Geurin, MPH, RD. This in turn can help boost your HDL (good) cholesterol and lower your LDL (bad) cholesterol and triglycerides—all of which may reduce your risk of heart disease. So if you’re considering dabbling in Veganism, here are a few easy meal ideas for breakfast, lunch, and dinner. Include them in your diet a few times per week and reap the nutritional benefits. Milk is practically synonymous with breakfast, and for a good reason: The one-two nutritional punch of protein and calcium is a great way to start your morning. To match milk’s intake of nutrients, try blending a smoothie made with calcium-rich spinach, tofu and almond milk. “When you cut out dairy, you want to eat more dark green leafy vegetables to make up for the loss of calcium,” says Trish O’Keefe, RD, and author of Dishbytrish.com. For a creamy, dairy-free breakfast smoothie, blend together 1 cup silken tofu, 1/2 frozen banana, 1 cup diced mango, a splash of orange or pineapple juice, a drizzle of honey, 1 packed cup baby spinach and enough almond milk to blend into a smooth consistency. Eggs are another morning meal classic. They’re loaded with enough protein, which keeps you full until mid-day, and they take on the flavor of just about anything they’re mixed with. Luckily, so does tofu—another great source of vegan protein, says Geurin. For an easy vegan breakfast burrito, heat a drizzle of olive oil in a large skillet over medium heat. Add a handful of chopped veggies (leftovers from last night’s dinner are a good option) and sauté until just softened. Toss in about 1/4 pound firm tofu that’s been patted dry. Sprinkle the mixture with salt, pepper, garlic powder, ground cumin and smoked paprika. Stir the veggies and the tofu until the ingredients come together. Scoop the food out and wrap it in a warm whole-wheat tortilla. One misconception about vegan diets is that to hit proper protein levels, they require mysterious meat substitutes. “Nearly all vegetables, legumes, grains, nuts and seeds contain protein,” O’Keefe says. Toss enough of these foods together, and you’ll meet your quota. One good way to do so is by making a Moroccan-inspired chickpea and rice salad. Combine 1 cup cooked brown rice, 1 can drained and rinsed chickpeas, 1 small diced red bell pepper, 1 tablespoon raisins or dried currants, a sprinkle of slivered almonds and 2 minced green onions. For the dressing, whisk together lemon juice and extra virgin olive oil, to taste; whisk in 1/4 teaspoon each ground cumin, coriander, cinnamon and black pepper. Add salt to taste, and refrigerate overnight to allow flavors to blend. Combining the rice and chickpeas makes a complete protein, while the bell pepper, currants and almonds all add fiber, vitamins and minerals. Another easy lunch idea is gingery carrot and white bean soup. Creamy and filling but low in calories, this soup is packed with fiber and the carrots deliver a hefty dose of the antioxidant vitamin A. “A high-fiber diet is linked with a reduced risk of heart disease and certain cancers, and antioxidants combat cancer-causing free radicals,” says Geurin. Combine 1 pound chopped carrots, 1 small chopped onion, and 1 tablespoon chopped ginger root in about 3 cups vegetable stock. Simmer until carrots are tender; add a can of drained, rinsed white beans. Season with salt and pepper to taste. Carefully puree in a blender; serve warm drizzled with extra virgin olive oil. Pair with vegan pita chips for a little extra crunch. All too often, dinners revolve around one protein paired with a few vegetable side dishes. But by moving veggies to center stage, you can make your meal even healthier. For example, many people cook beef for dinner—and while meat is indeed a good source of iron, mushrooms and dark green leafy vegetables are even better sources of this mineral on a per-calorie basis, says O’Keefe. By combining the two with high-fiber buckwheat soba noodles (which can reduce the risk of developing high cholesterol and blood pressure), you’ll have a robust, nourishing supper in no time. Heat olive oil in a skillet over high heat; add chopped shiitake, Portobello and/or crimini mushrooms to the pan, tossing to combine; let sear until parts are dark brown. Turn heat to medium-high and add 1 bunch chopped lacinato kale (also called Tuscan kale) and season with salt. Cook until kale wilts. Meanwhile, cook soba noodles in boiling water per package directions. Toss drained soba into skillet and season with soy sauce, toasted sesame oil and toasted sesame seeds. 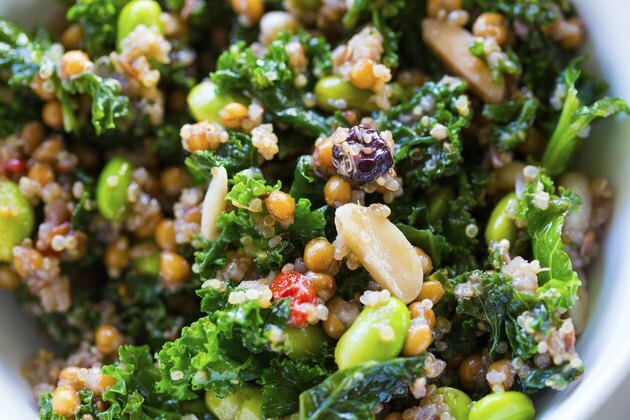 “Another great—and complete—protein source is quinoa,” Geurin explains. For dinner, try making whole-grain risotto primavera, which combines high-protein quinoa and high-fiber barley, which can help lower LDL cholesterol and control blood sugar. Adding a variety of vegetables to the meal will pack even more fiber, vitamins and minerals to the meal. Toast 1/2 cup of each quinoa and pearl barley in a drizzle of olive oil in a large, deep-sided sauté pan over medium heat until just golden. Meanwhile, heat 4 1/2 cups vegetable broth in a small saucepan over medium-high heat until simmering. Ladle in vegetable broth, 1/2 cup at a time, stirring until grains absorb broth before adding the next ladleful. When grains are tender, add in 2 handfuls chopped spinach, 1/2 cup frozen peas, 1/4 cup chopped basil, 1/2 pint halved cherry tomatoes, and salt and pepper to taste. Stir until vegetables wilt and everything is hot. Meat isn’t the only source of protein. By incorporating these non-animal based foods into your diet, you can reduce your of saturated fat intake while meeting your daily protein quota. TEMPEH – Made from cultured and fermented soybeans, tempeh mimics the texture of meat. It also has an earthy flavor, which makes it an especially good substitute for beef. Try it in tacos, stews and pot pies. TOFU –It gets a bad rap as bland and boring, but this curd—made from soybean milk—can take on the flavor of almost anything you pair it with. For those averse to its soft texture, try using extra-firm tofu and pressing it between paper towels for an hour before using. EDAMAME – These soybean pods have become a ubiquitous sushi restaurant appetizer, but the shelled beans are also delicious as a side dish, like succotash. Or puree them oil and herbs to make a tasty spread. BEANS – Bored with the run-of-the-mill bean dishes? Try mixing mashed black beans into brownie batter for an extra dose of fiber and protein. Or create a festive (and easy) dip by pureeing pinto beans with jarred salsa. LENTILS – Lentils are filled with protein, as well as folate, iron, magnesium, calcium, potassium and zinc, making them a nutritional powerhouse. Try sautéing lentils with spinach, smoked paprika and diced, cooked potatoes for a tasty, one-dish meal.